This week we discuss 3 methods for writing your next book. These methods are most appropriate for non-fiction books but may be used as a framework for fiction as well if you wanted to get creative. Hello, and welcome back to the Modern Publishing Podcast. I hope everybody had a good holiday last week. This week I would like to talk about three methods that you can use for writing your next book. •	The first method that you can use is to just write the book from start to finish. •	The second method is to write the book from an outline or a mind map. •	The third method is to write the book from a transcription. So let’s start with just writing the book start to finish. I don’t really recommend writing your book this way because it can be hard to get momentum, and if you do do it straight from the start to the finish, then you actually wind up missing out on quite a bit. For today’s topics, I’m mostly going to stick with nonfiction books because that’s what I have the most experience with. But usually when you start out a book, you want to have some sort of introduction, then you want the meat of the content, and then you want some sort of conclusion. If you are going to write start to finish where you just sit down, start at Page 1 and go Chapter 1, Chapter 2, Chapter 3, I still recommend that you wait until after everything else is written to write your introduction and your conclusion. Because once you’ve actually written down what you want, whether you’re working off from an outline or just completely pantsing it, you want to have your introduction provide an accurate summary of what people are going to learn and what they’re going to get out of your book so that they can read that introductory information and they can tell whether this is something that’s going to be right for them before they’ve waded too far into your book. The general formula being you tell them what you’re going to tell them, you tell them, and then you tell them what you told them is pretty tried and true, and certainly worth going through and following. I’ve done this for some short works, and a lot of articles I’ve written this way, but it’s not a method that really works very well for me getting into an actual book-length work. So it’s not something that I would necessarily recommend that you do. The second method, however, is how I wrote my first full-length book, and it has a lot to recommend it. What you do is you create a mind map or an outline that’s relatively detailed. Then once you have that, you sit down and you write each piece as its own bit of the book so you don’t have to necessarily write everything in order, you write what you’re most excited to write about and that way you can build momentum. So if you write what you’re most excited about at the beginning and that includes 60 or 70 or 80% of the material, then you’re not stuck with that material at the beginning that may not be quite as exciting but that needs to be there for whatever reason. So doing it this way is a lot easier to write that last 10 or 20 or 30% of the book when you’ve already got so much momentum and you have so much already finished rather than just waiting until you get to that part and just feeling like you have to write that specific piece at that time. So one application that I’d like to recommend is a quality mind mapping application, and mind mapping is basically a way of outlining that’s a little bit more free form than just having a bulleted or a numbered list. So when I wrote my first book on marathoning, I had a central concept that I wanted to write about, and then from there I just branched off on the different areas about running a marathon that I wanted to discuss in the book, and from each of those separate areas, I could then break those into the specific points that I wanted to make in each one of those chapters. Then from within there, I discussed the individual topics that I wanted to go through such as choosing your marathon in pre-race and then having a section on training for your marathon, et cetera. Then on race day or on race week, what to do in the week leading up to the race, what to do before your race, different ways of running during the race, and I had those smaller topics which wound up becoming the chapters. So this way I came up with the three general areas of the book, the three parts to the book. Each of those had two to four chapters each so I wound up with ten or eleven chapters, and then I further broke it down inside there for the points that I wanted to make inside of each chapter. So that helped me organize what I wanted to write about and where it was going to go in a very loose sense, and when it came time to writing, I just spent a couple of weeks working on the outline. Then I sat down and spent the next month and a half or two months (I forget how long it was, this was five or six years ago at this point), and I just started with what I was most excited about and I went in and I would write in some cases a quarter to half of a chapter at a time. I might start with something in the middle of the book and then something towards the end and then something in the middle again and something towards the beginning. So I was able to build up a lot of my word count really quickly by writing what I was most excited about and just stealing that time to get the book written back when I was just having an extra hour or so a day from my day job in order to get it done. The nice way of writing it that way is, as I said earlier, why you want to write the introduction last is I put in the information, the chapters at the beginning of my book and that was one of the last things that I wrote, so I already knew what it was that was going to be in there, and I had already tweaked everything the way I wanted it to be so it was a lot easier for me to be able to go in and tell people exactly what was going to be in that book. These days I actually use a third method for writing that is even faster and it’s actually quite easy. If you wanted to have the bulk of your book written in a single weekend, it’s quite easy to do that. Now, if I was going to go back and write my book on marathoning again, what I might do instead of creating a detailed mind map is do the same kind of process except instead of having multiple break downs of everything, I might have smaller break downs. So that instead of having everything in one kind of central place and then just building on that outline, I would go in and I would set it up so I have each chapter still. Ten I might have some bullet points for each one of those, and I would just print them out as big as I could on a single piece of paper for each different section or I might make a PowerPoint slide for each individual chapter that has the bullet points of what I want to cover in that chapter or a sentence that tells me about what’s going to be the main parts that I want to talk about inside of that chapter. If I was going to print them out on paper, what I would do is actually just take each piece of paper along the wall in the room, if I was just using the presentation, I’ll probably stand in front of my computer with the PowerPoint or the Keynote presentation just up in front of me on the screen, but then I would take a voice recorder or a microphone or something along those lines and just record the content for each chapter. It doesn’t take a lot of effort. I can go in and talk for three or four minutes on each bullet point for each chapter so that I would wind up having somewhere in the 10-minute or so range of talking about each individual chapter. I would probably keep those as separate audio files, and then what I would do is I would send those off to get transcribed. When I get the transcriptions back, I can then go in and actually edit those into the manuscript and it would be a much quicker, more efficient way of getting my thoughts down onto the computer screen so that I don’t have to sit there and type everything out. It’s a lot easier for some people to sit there and just talk about their knowledge on a subject than it is to try and type it. Even for people that are a little more kinesthetic and would rather do the handwriting or the typing, they may just be a lot faster by going through and speaking instead. So it’s something that’s worth trying I think. Now, there are a lot more editing that’s going to be involved. You definitely have at least one or two extra passes because we’re not necessarily going to want exactly what we’re saying to be the content of the book itself. You’re going to want to rephrase things. There are going to be a lot of repetitions, and you’re going to need to be a little bit more careful about how everything is organized to make sure that it still make sense. But even with that extra editing pass, I found that it’s just a lot faster than going in and trying to write everything out longhand and it’s certainly a lot better for carpal tunnel if you have any kind of problems with that. Now, if you’re going to use a mind mapping application, these days I’m recommending that people use a free application called xMind. There is a premium version that allows you to do some extra things, but for the purposes of just creating the mind map and being able to navigate through it and track with it, you can use the free version just as well. Another completely free application is called FreeMind. There was recently an update to it after a couple of years of no development. I haven’t really used it for probably about a year and a half to two years now just because it had stopped getting developed and there were some bugs and it was difficult with file versions. Some of the files created in one version wouldn’t work in another, and I just wasn’t a big fan, but you can find that for free. Then there are also some paid solutions such as Mindjet which I’ve never used. I have been happy with FreeMind and now with xMind, so that’s what I use. For recording my voice, depending on whether I want to be standing in one place, I would just use the microphone on my computer or if I wanted to be walking around which is more often the case, I tend to walk when I’m on the phone or when I’m talking, then I would just use a digital voice recorder, and I’ve owned a few of them. You can get them for anywhere between $10 and $100, or you can probably just download an app if you have a smartphone and just record directly into your phone using a Bluetooth headset, and then you wouldn’t have any extra expense there other than maybe a couple of dollars to record using the app. I haven’t used my phone itself since I’ve only had a smartphone for a relatively short time at this point, but I now already have a voice recorder and a good microphone from my computer so it’s not something that I’ve looked into, but I do know that there are apps that you can use to take advantage of what you have. So to reiterate what I’ve been saying, the basic process for writing a book is to hopefully create some sort of an outline or some kind of a map of what you want your book to look like and what you want to accomplish, then to go out and write that book, whether it’s writing from start to finish, or writing each piece, starting with what you’re most excited about and then following through with the rest of it to fill in the gaps, or if that includes just standing up and talking about what it is that you want to be recording and then getting it transcribed and editing it afterwards. Then once you’ve written everything, there will be another editing pass that you want to do no matter which method you use to make sure that you fix as much of the flow, to that you include everything that you wanted, that everything is organized in a smart way that’s going to help people understand what it is that you’re saying, and then from thereon, you want to do a pass where you’re looking for grammar, punctuation or things of that sort. Once that’s done, you’re ready to move on to the next step which is creating your actual book and getting it published. One extra tip that I want to offer you when you’re going to transcription route is always stand when you’re doing your recording. It makes it much easier for you to think. It makes it a lot easier for you to get your ideas across in an understandable way. It’s a lot easier to speak more clearly. Don’t try recording while you’re sitting. You’ll do much better if you’re standing up, or even better yet, if you’re walking around, then you’re getting a little bit of blood flowing through your body and into your brain. This has been Episode 8 of the Modern Publishing Podcast. 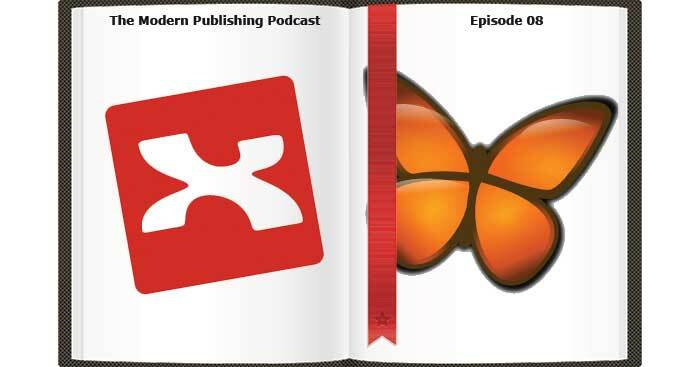 If you want any links to the software that I had mentioned in today’s podcast, then go to ModernPublishingPodcast.com/8 and that will redirect you to the show notes for this episode. I’m looking forward to talking to you again next week.